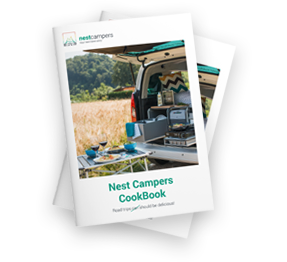 We could’ve written a whole book about our road trip with Nest Campers this summer. Imagine eight days, five good friends, two great campers, one beautiful country (well, technically we’ve added a bit of Italy to Slovenia as well), too much adventure spirit, too little sleep and nice weather on our side. At first, our plan was to cover only Slovenia and see most of it, but when discussing our itinerary plan with Nest Campers crew, they recommended us to do a short side trip to Italy as well. None of us had been to Italy before, so we were instantly hooked to the idea! Few days into our trip, after we’ve already seen and covered much more than our memory cards could take (Ljubljana, Škofja Loka, lake Bled, Vintgar Gorge, Radovljica, lake Bohinj, waterfall Savica, Vrata Valley, lake Zelenci, Martuljek waterfalls, …), we woke up in Kranjska Gora. Our plan was to go to Soča valley and spend the next few days there - camping, hiking, exploring, rafting. Only 3 kilometres west of Kranjska Gora you'll find Zelenci Springs, located just a short walk from the main road. Fascinating place! There are two options to get to Soča valley from Kranjska Gora. One way goes through Vršič mountain pass in Slovenia, the other one goes through Predil mountain pass in Italy. Thanks to Nest Campers suggestion, we opted for the latter. And we were not sorry. We followed the road that took us to Italy and soon we made a long stop at Predil Lake (Lago del Predil), which is situated near the Slovenian border about 10 kilometres south of the town of Tarvisio, Italy. This gorgeous lake with green and turquoise waters is surrounded by an imposing mountain panorama and there is a small island in the middle as well. As it was super hot on that day, it took us less than 3 minutes to jump into crystal clear water and refresh ourselves. This lake could have easily made it into a multiday stop - there is a camping place nearby, a beach with sunbeds, deck chairs, umbrellas, playground, restrooms, dressing rooms and you can rent pedal boats, kayaks, rowboats and others. But there was so much more to be explored! After eating some overpriced ‘Italian pasta’ at the lake-side restaurant, we rushed back to our Cuckoo campervans and continued our way up the Italian mountains. Our next destination was Altopiano del Montasio, which lies on altitude from 1500 to 1700 metres. Lake Predil as seen from the road. Access to plateau Altopiano del Montasio is easy, since the narrow paved road leads all the way up there from Sella Nevea mountain pass (the road is however not suitable for huge motorhomes). Altopiano del Montasio was recommended to us by Nest Campers crew and boy, it did not disappoint! This area is well known for its alpine huts, the production of cheese (which was first made by Benedectine monks in the mountains around the year 1200), beautiful landscapes and many alpine animals. If you're lucky enough, you will see little marmots and sometimes even animals like ibex, chamois, eagles, buzzards and more. We opted to go for a short hike to Rifuggio Di Brazza, which takes around 30 minutes. It’s an easy hike to get to this mountain hut, where beer is served really cold and the views are stunning! On the way up we tried to spot a marmot, but none of us was lucky enough to see one. Rifuggio Di Brazza - it takes only 30 minutes to get to this small mountain hut and just look at the views! When we asked hut wardens about marmots whereabouts, they pointed us to their usual location and on the way back we finally saw them! This little creatures are really shy and they will allow you to get up to 10 meters close. The best is to take time, sit on the soft grass, get your cameras ready and wait. Our Cuckoo campers were easy to drive and had everything we needed on our road trip, plus Nest Campers crew gave us some really nice suggestions - thanks again guys! Back to Slovenia - we spent next few days in Soča Valley and can't wait to come back for a new road trip. We had a blast!